The Taylor Cub kit is a 1:35 scale, flying model. Its pre-1942 design is eligible for Flying Aces Club Dime Scale and Society of Antique Modelers (SAM) contests. Produced by the Taylor Aircraft Company during the depression, the Cub was a successful two-seater monoplane. All rights to the Cub were later acquired by William T. Piper who continued its production as the Piper Cub. This is a scale model of the Taylor Cub. 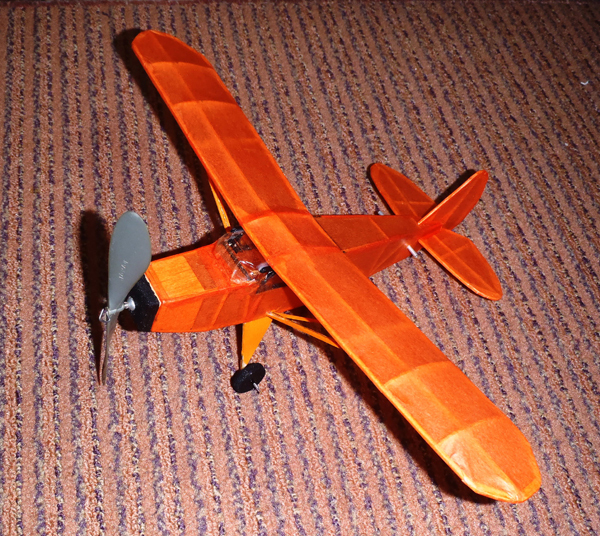 This free flight rubber powered kit contains a full-size rolled plan, building and flying instructions, laser cut balsa parts and hand-picked balsa stripwood, rubber motor, E-B propeller, EBM thrust bearing, clear plastic for the windshield, wheels, and Easy Built Lite tissue in white and orange. To build this model you will need a building board, hobby knife, fine sandpaper, and glue.